Pre-orders have opened for the Withings Activité, the beautiful-looking watch that also happens to be a fitness tracker. Unfortunately, the price is right in line with other quality watches: four hundred and fifty of your finest American dollars. 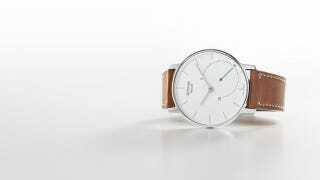 If you remember, Withings debuted the Activité back in June, along with a tentative $390 price point. That seems to have changed in the last few months, and pre-orders are now open with a $450 price tag. That doesn't seem to be deterring buyers, however, with stock levels showing just 3% left as of the time of writing. The other details haven't really changed, though — it's still a smart, classical-looking watch with hidden fitness-tracking capabilities. It can track the steps you take, the calories you burn, your sleeping patterns, and the distance you've traveled. It comes in both black and white, with a stainless steel case, a nigh-unbreakable sapphire glass face that acts as a simple touchscreen to toggle between settings, and real leather bands you can swap out for plastic ones if you're feeling particularly active.